Answer: You End Up Owning The House for the price of the tax lien. This is why tax lien investing is one of the safest investments in America. It’s a win win situation. If the home owner redeems you and pays you back. You get your principle plus interest. If the home owner does not pay you back for the tax lien you own you get the property free and clear, mortgage free. The biggest deals come from people who do not redeem your tax lien. One year property tax is usually 1%-2% of the total property value. Therefore if the homeowner does not pay you for the tax lien you will end up owning the house for 1-2% of market value. As long as you stay consistent in buying tax liens you will get good deals. Let’s say you buy 100 tax liens in 1 year. 97% of the tax liens are going to redeem and give you back your principle plus interest. 3% you are going to end up owning the house free and clear mortgage free. 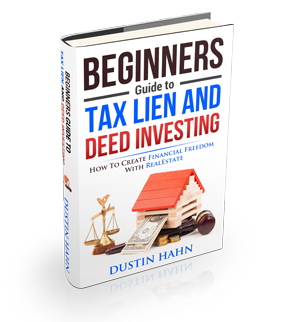 Thanks for reading this post -> If you have any questions, great stories or would some more information on Tax Lien & Deed Investing, like, comment below, and one of my fantastic support team will get back to you!